After 10 years of covering this country for International Living, you’d think writing about the best places to vacation in Panama would be a cinch. The more you know, the easier it should be…but the opposite is often the case. I know so many great Panama vacation destinations that it’s hard to narrow it down to just a few. There are places like the jungles of the Darien that appeal to adventure seekers, and places like Isla Contadora that offer eco-tourists in Panama a bit of luxury in a green environment. And then there are the must-sees…vacation spots in Panama that no traveler should miss. Here are three destinations that represent three different “faces” of Panama. At the top of the list are the islands of Guna Yala, formerly known as the San Blas islands. Here, the Guna (formerly spelled “Kuna”) live much the way they did when the Americas were first “discovered.” The Guna have their own autonomous government and they are diligent about protecting their reserve lands, allowing only low-impact, sustainable tourism. You won’t find any big-name resorts here—only eco-friendly huts and small hostels. There are more options than ever these days, but I would go with Yandup Island Lodge. The island is close to the Ukupseni community, which many agree is one of the region’s most beautiful. Beware, first-time visitors feel like they’re dreaming when they see the baby-blue waters dotted with itty-bitty islands. White sand beaches are everywhere you look and you can swim from one to another. The only way to get here is by air on a small plane. Visit Air Panama to check out flights to the Playon Chico airstrip. Remember, you’ll be in traditional dwellings (typically with mosquito netting over beds) no matter where you stay in Guna Yala. Don’t expect air conditioning and don’t “bug out” if there are a few bugs. Bring eco-friendly mosquito repellent and sunscreen and you’ll be all set to enjoy the famous baby-blue waters of the Caribbean. Explore nature and take in Panama’s mountain views in Boquete. 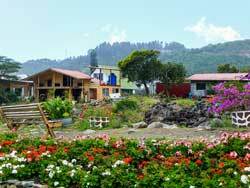 Once you’ve had your fill of the beach, consider a visit to the little mountain town of Boquete and neighboring towns like Volcan. You can get there via a seven-hour drive from Panama City, but I prefer to fly an hour to David City and take a bus or rental car from there. It’s a 40-minute drive from David to highland towns like Boquete and Volcan. In Boquete, be sure to visit The Rock, the best restaurant I’ve been to in years (the views are jaw-dropping). Head to Volcan or Cerro Punta for strawberries and a thick, goopy cream called nata, or fresh mixed berry milkshakes…there are multiple stands but Dulces Caseros Alina’s is the best-known. Just ask any local where to find it! There’s so much to see in this area, you’ll have trouble choosing. You can visit ancient petroglyphs at El Nancito Archeological Park, see thoroughbreds at the famous Haras Cerro Punta horse farm, or hike through the bi-national La Amistad forest (or to the top of the 11,000-foot Baru volcano). Believe it or not, Panama City is my top pick for best places to vacation in Panama. I can’t help being biased—I choose to live here and absolutely love it. Just head to the picturesque promenade that is the Cinta Costera and you’ll see why. The Cinta wends its way along the Panama Bay, offering snap-worthy views of the sparkling city skyline. You can walk from the Banking District to colonial Casco Viejo and see some of the city’s best features along the way. For a great weekend in Panama City, here’s what I recommend: contact Los Cuatro Tulipanes and rent a beautifully restored colonial in Panama City’s historic quarter, Casco Viejo. Spend a day or two exploring the stately plazas and enjoying the cool food and nightspot scene. In Casco, Plaza Bolivar is my favorite spot to people-watch…it’s lined with cafés and the site of the famous Salon Bolivar, where Simon Bolivar tried to create a league of nations and thus unify the region. On any given evening in Casco Viejo you’ll find venues offering live jazz, salsa, classic rock, and more (make sure to take in a gig at Danilo’s Jazz Club, at the elegantly restored American Trade Hotel). Panama’s art community is centered in Casco and events here vary from film screenings to “artblock” parties that continue from one block to the next. Dress is typically casual or bohemian chic. Restaurants run the gamut, from gourmet places like Tomillo to neighborhood dives (my favorite is microbrew pub Rana Dorada de Casco Viejo). 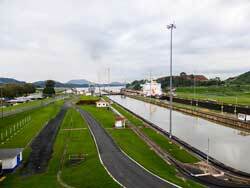 The Panama Canal is a must-see for anyone visiting Panama City. Naturally, you’ll want to see the Panama Canal while you’re in town. The Miraflores Visitor Center is just a 20-minute drive from Casco. Or for a nice day trip, drive 10 minutes to the Amador area and catch a ferry to Taboga Island. It’s just 12 nautical miles offshore…perfect for a quick beach fix. When you get back, take a quick shower and get ready for another great night in the city. Plenty of Panama City’s neighborhoods are walkable, including Casco Viejo and El Cangrejo. For longer distances, you have the Panama City Metro and Metrobus system, a vast cadre of yellow cabs, and more upscale services like Uber and Tuchofer, so there’s no excuse to stay in your hotel room. Go hiking or birding around Gamboa. Rub shoulders with friendly and beautiful people at trendy downtown bars. Try new and exciting foods. The point is, it’s a convenient, modern city offering a huge range of activities…so just get out there and explore!